If there is a fruit I like to take pictures of, it is apricots! I am a huge fan of its color. The wall in our living room is in apricot color. Such a nice, warm color. 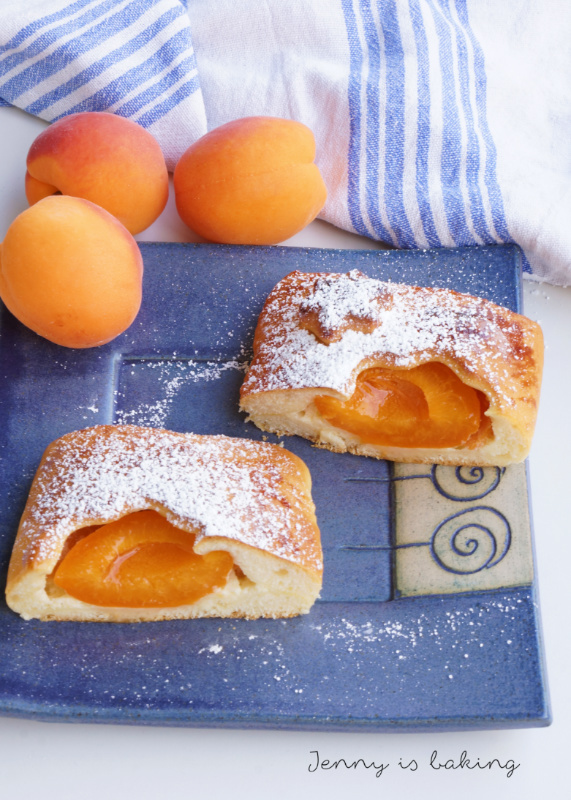 So I am excited to present to you apricots turnover. They taste just the way they look: warm, juicy, summerish, and refreshing. I just love apricots. Funnily enough, the plain fruit is fine, but I usually prefer them baked paired with for example cream cheese. For that reason when Angie from the link party Fiesta Friday asked me to co-host the party this week, I was happy to support. Because I believe I have a really great recipe here. 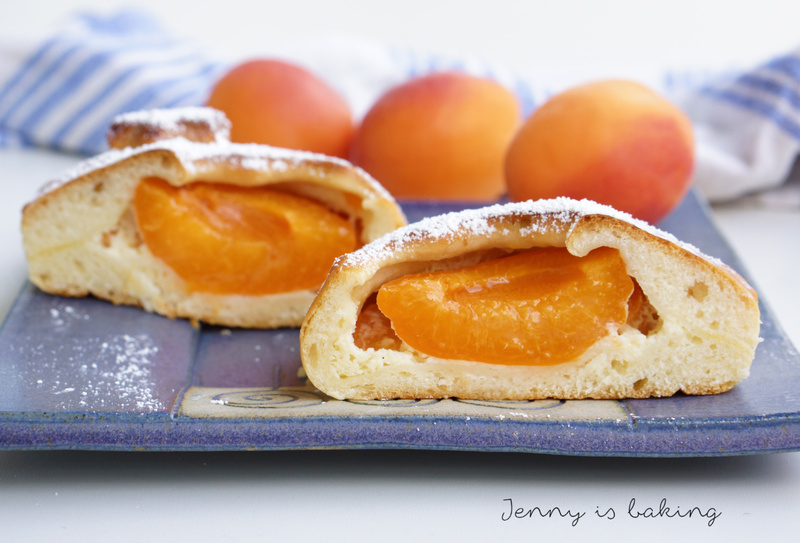 Apricot turnovers with an extremely fluffy dough, a lot of apricot filling and some cream cheese. Yum! What I like best is that the dough even though yeast is added, does not need to rest as you add baking powder. So everything can be done right away. Do I need to say more? By the way, if you are a food blogger, feel free to join the party as well. You may meet some interesting people and make your recipes available to a larger audience. As stated, please visit Fiesta Friday for this. The other co-host of the party today is Liz with her blog Spades, Spatulas & Spoons. For the yeast dough combine the flour, sugar, baking powder and yeast in a large bowl. Set aside. Warm up milk until lukewarm and stir in the oil and egg yolk. Add the milk mix to the flour mix. Using your hands or a mixer, knead the dough for at least five minutes. If necessary, add a little flour. The dough should be elastic and soft, but not stick to your fingers anymore. Form to a ball and set aside. Prepare the cream cheese filling in a medium-size bowl by creaming the egg with the sugar and vanilla extract until lighter in color. Add butter, cream cheese and vanilla pudding and cream until silky. Divide dough into two equal parts. Roll out one half of the dough (no need to rest, this can be done immediately) into a large rectangle, dough can be fairly thin. Cut into rectangles of 10cmx15cm. You should have about 6-7 rectangles per each half. Place a good heaping of a teaspoon of the cream cheese filling on one side of each rectangle. Cut one apricot in half and place one half facing up on top of the cream cheese. 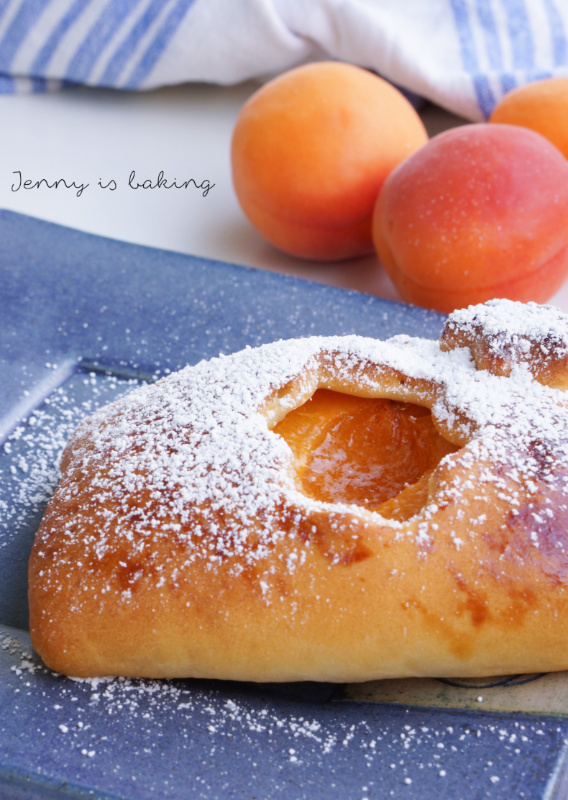 Slice the second half of apricot in slices and place around the apricot half. Repeat with all turnovers. Brush edges of the empty side of all rectangles with egg white before you fold the turnover in half. If you like to, you can cut out small shapes (you can see the star in mine) before you fold the turnover and make sure the egg wash glues the two pieces together, pressing down the edges. Place all turnovers on two baking sheets lined with parchment paper and brush with more egg wash.
Bake one baking sheet at a time for around 20 minutes or until golden. I have successfully baked only half of the batch and put the other half of the dough covered in plastic wrap in the fridge over night. This turnovers definitely taste best on the day they are baked. I looove apricots! These look so light and delicious! Yes, I love them, too! I just made apricot jam so that I can enjoy some of this summer flavor in winter. These look delicious. The apricot color is one my own favorites as well, several of my garden roses are shades of it. Lovely. Hey Liz, happy co-hosting! Yes, I feel apricots look and taste like summer. I lke my surroundings to be in this color. Hi Angie, thanks for the compliments! This recipe also works with dry apricots. Oh, yum! And aren’t apricots pretty? 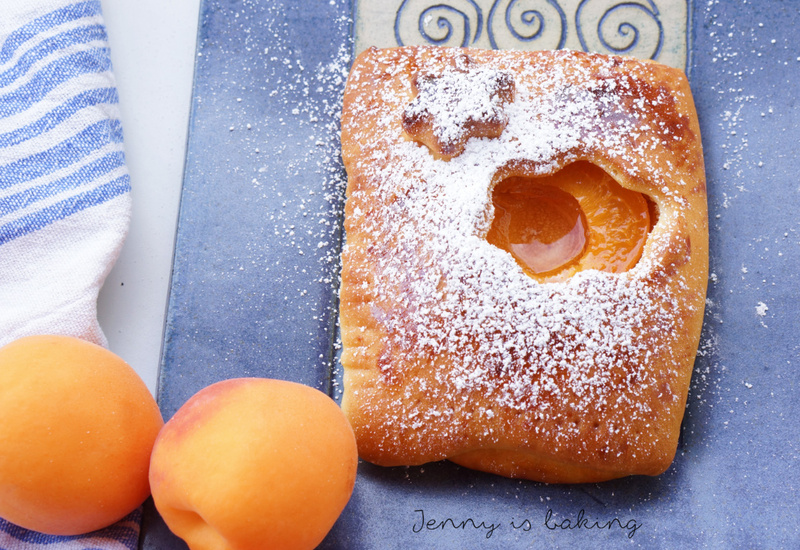 I had a photo on my blog once with an apricot half and my sister freaked out – she thought it was a big old raw egg yolk, lol! But hopefully my pics are getting better these days! 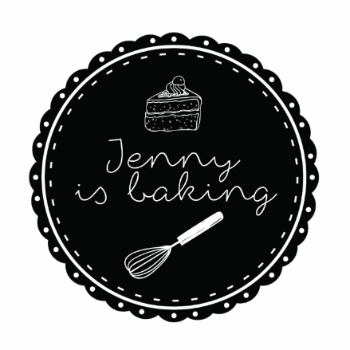 Jenny these look so good!!! 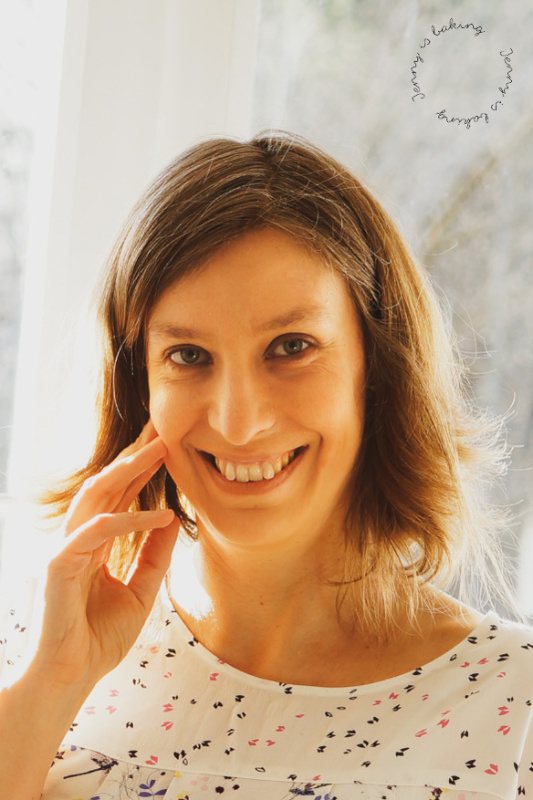 Das freut mich sehr, Sarah!